You must make reservations at least 5 minutes in advance of the time at TikiCat. 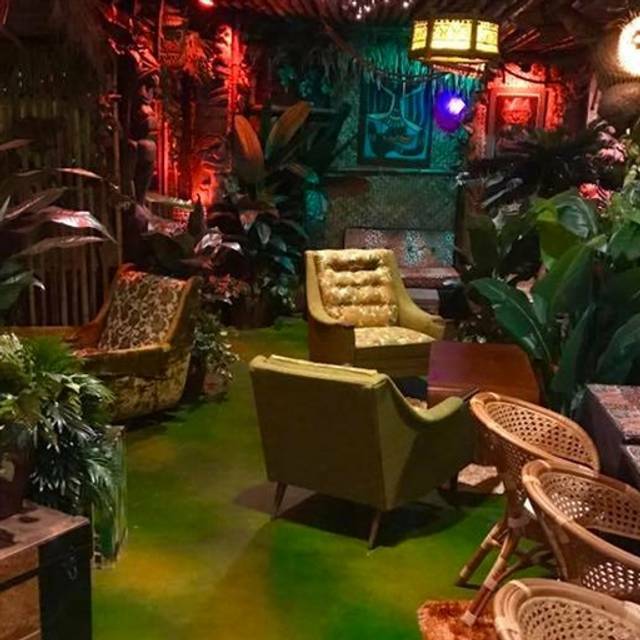 Welcome to TikiCat, a "secret oasis" in the basement of HopCat KC Featuring tiki cocktails, our hand-crafted creations are sure to delight fans of the phenomena that is Polynesian Pop. 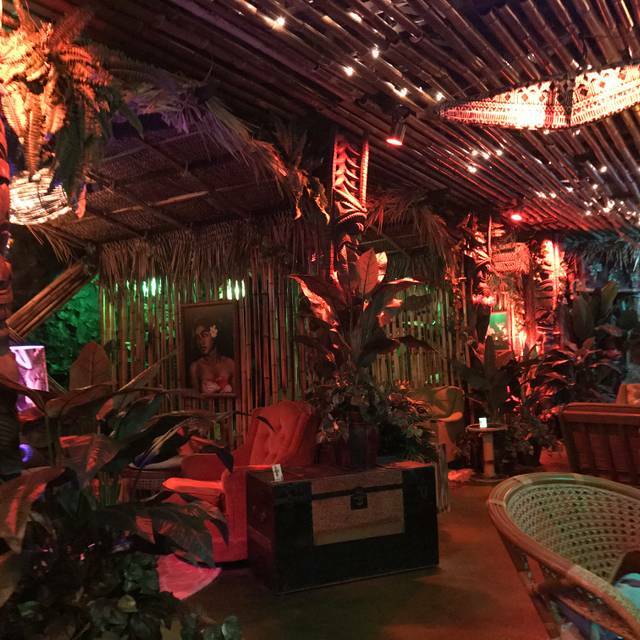 TikiCat is a cocktail-only oasis. 21 and over. *Must have valid ID to enter. A credit card is required to make a reservation. Late Cancellations ( within 30 mins of reservation) will be charged $10 per person. If party has not arrived within 15 mins of reserved time, it will be considered a late cancellation. Note: we are an oasis of limited space; we ask that parties of 6 or more call us directly. We can accommodate only the number of people in your reservation. Saturday's from 2:00pm - 5:00pm No reservation required. This place is really fun. The drinks and staff are amazing. I would highly recommend. 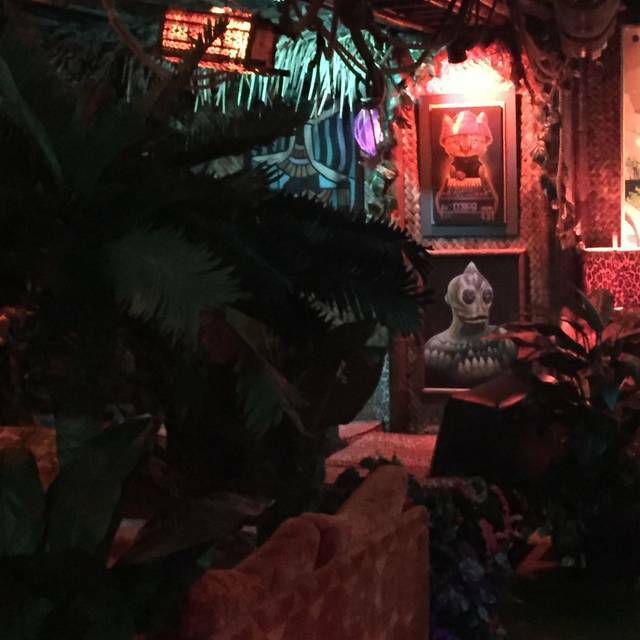 Very cool tropical-themed speakeasy in KC. Only drinks, very strong ones at that - but expertly made and delicious. Absolutely a must stop if you are in KC. Also, FYI; drinks only, no TVs, small bar to bring your friends/girlfriend to drink in and talk. I highly recommend making reservations beforehand. Try the zombie, but drink it slowly! Great place with amazing drinks. Our experience was a pleasant one and we will be back. Must visit this place, instantly put me back in Maui! Great drinks and ambience! Unique experience but service was slow and the drinks tasted awful. They definitely don’t know how to make mixed drinks. 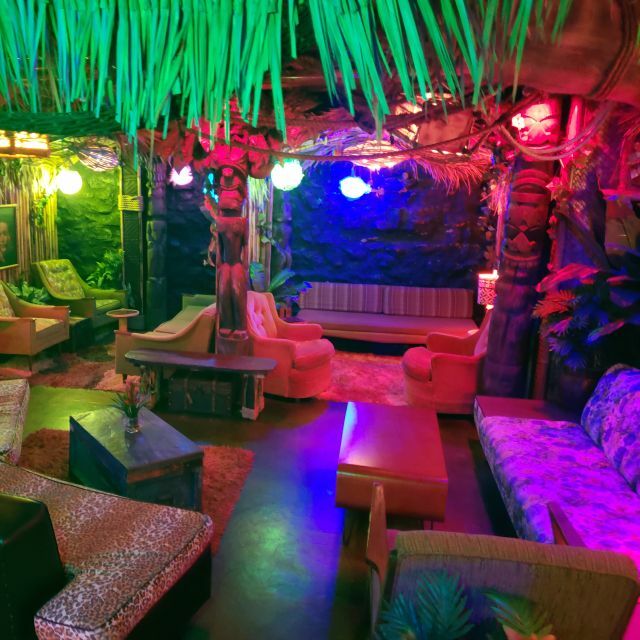 TikiCat is awesome - a great atmosphere with delicious hand-crafted cocktails. My one recommendation is to offer snacks! This is my favorite place in KC. Almost feels custom made for me. Jen’s a fantastic bartender and the atmosphere is kitsch-rich! I love it! Wonderful laid-back vibe and delicious drinks. We sat at the bar and the bartender told us about the drinks she was making. They don’t have servers so when you want a drink you go to the center of the bar and someone takes your drink order. Well-organized and smooth process. Drinks were Beautifully crafted, delicious, unique and lots of variety. Loved this place!!! We will return!! 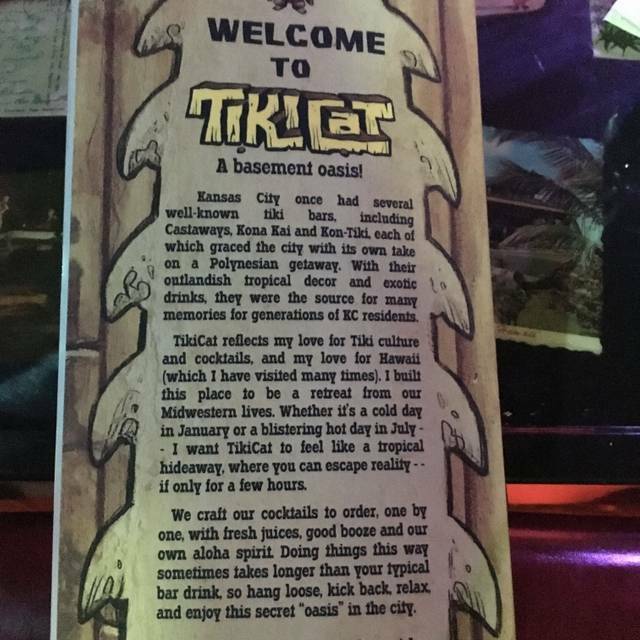 I really enjoy Tiki Cat, great atmosphere, great drinks, and the added "cool factor" of a secret door really ramps it up for me. We had a great date night at TikiCat! Very fun and cool bar with some awesome drinks! Had a fun time. The drinks are quite tasty and very potent. For one, this place is hidden in HopCat so dont be confused when you dont see it. 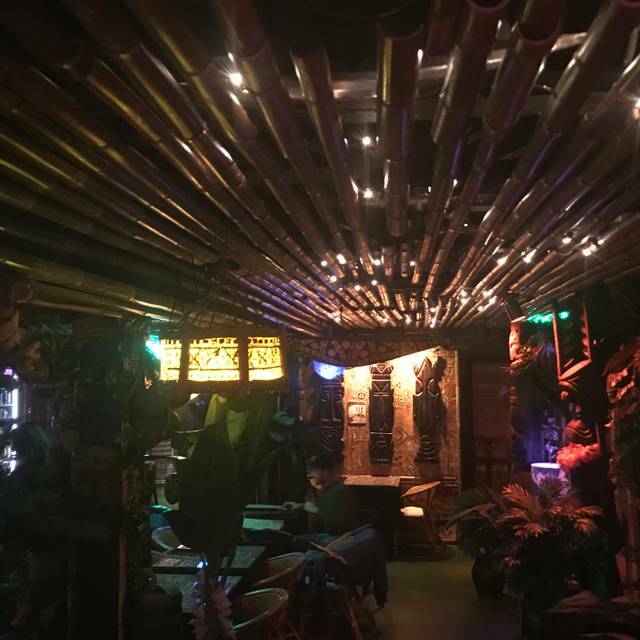 Friendly and knowledgeable bartenders, incredible ambiance, totally immersive experience with beautiful drinks any tiki lover would go crazy for. This is definitely my favorite bar. I have come here with friends for multiple occasions and it's always a great experience. I have not tried a cocktail that I didn't like - they are always the perfect balance of alcohol and sweetness. While all of the staff has been great each visit, the service of the hostess (can't remember her name, she was there 3/28) stood out - she was so friendly and accommodating! I brought my mom and grandma here as their "last stop" before going back to Texas and TikiCat didn't disappoint! Service was excellent and drinks were wonderfully strong/delicious! 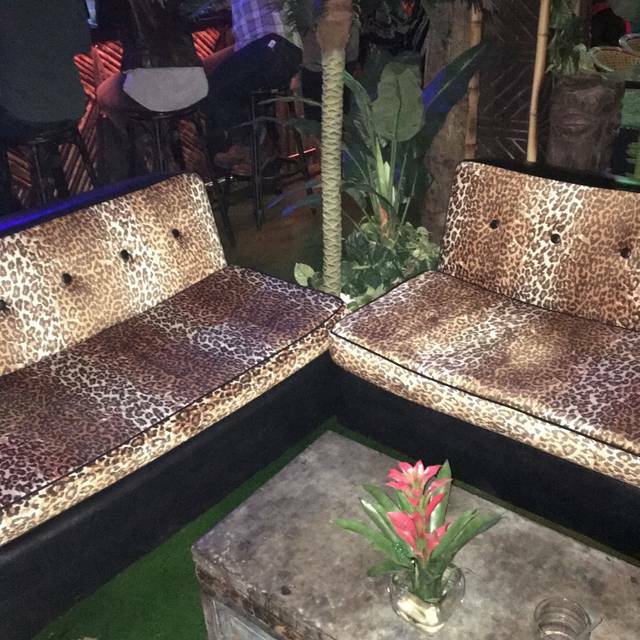 TikiCat never fails to deliver a great time. Thanks for being the best! The drinks were super good and strong. The atmosphere was chill. Had a wonderful time!! Everyone was so nice and friendly. The place looked great and the drinks were beautiful! My group sat in a couch area and we loved it. The decor of the whole place was great too. We all really had a wonderful time. I would liked to have some snacks foods available or a little more lighting in the restaurant. But neither of those thing are huge negative and didn’t affect our experience that much. Can’t wait to go back! We loved our first time at Tiki Cat. It was quiet, had enjoyable music, great decor, great drinks. We had a lovely time and will definitely be back. I always love my visit. The service that night was slow, but still very friendly. Have to say, I really miss Mark. His welcoming and in-character presence made it feel authentic. I think it would help if host and other staff dressed the part. Our first visit to Tikki Cat and we really enjoyed it. The atmosphere was fun and private. The service was great and the drinks were strong and tasted great! Great drinks, great service and great atmosphere. We will definitely go again. No food, only drinks. But wonderful drinks. And a wonderful place. It's hard to find a good quiet place to go, to relax and visit. This is it. The drinks were fabulous and the ambiance was perfect. We liked having to make a reservation with a 2 hour limit. It was not crowded. Everyone had a seat that was far enough away from each other that you couldn't hear others conversations. No food is served there so be sure to grab something before you go. The drinks are made stronger. Each person goes up and orders their drinks then they are delivered to your area. We highly recommend this place and will go back again. Also, its a nice place for any age over 21. You won't feel out of place. I would have to say, just my humble opinion, in light of the fact, considering the possibilities, along the same lines, but not comparing to, dependent upon that table, and the size of the glasses, in conjunction with, all around, in all seriousness, we really had a ball. Love the atmosphere! Try the “daylight come” drink if you don’t want a strong drink! 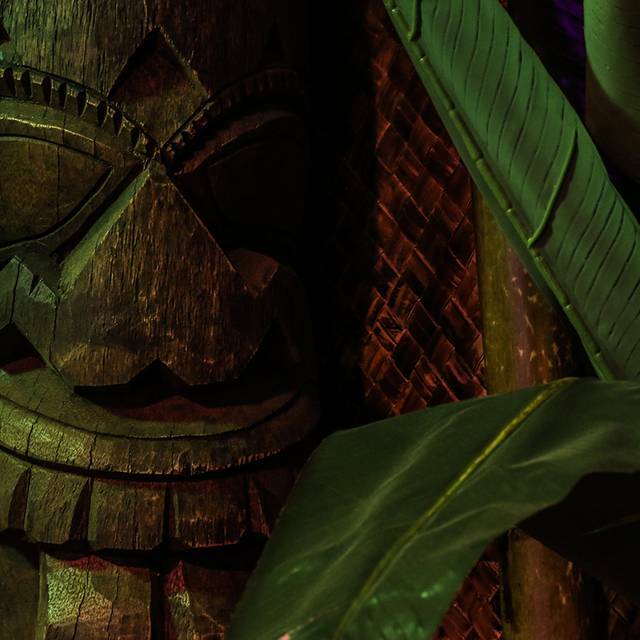 Really enjoyed the great Tiki Cocktails and music selection. 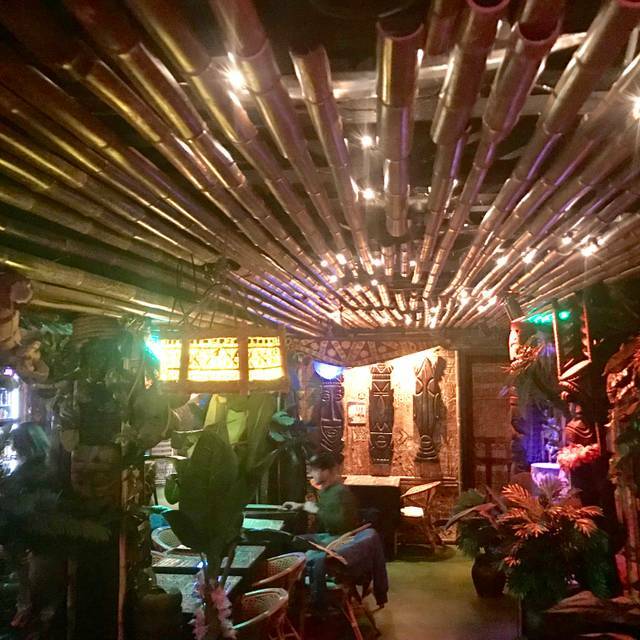 World-class tiki bar! I always have a great time there and the drinks are amazing. There was no food on the menu. There is also a 2 two hour time limit... so your options are to slam drinks or at best finish one..
Would be great if they served food, even if from upstairs. The drinks are strong and people could use some vittles. Great atmosphere. Background music was appropriate to the venue. Came for the tropical drinks and was not disappointed. They do not serve food at Tiki Cat. Food is available at the restaurant upstairs. We didn’t get food. Drinks were amazing!!! Definitely coming back!